(Seychelles News Agency) - After twenty years of democracy, many of South Africa’s ‘born-frees’ are voting for the very first time today. But these voters are somewhat different from the South Africans who stood in line for the very first time in 1994, waiting to make their mark in the first elections of the new democratic South Africa, their hearts and minds filled with hopes and promises for their new future. These voters, as young as they may be, are not letting emotions stand in the way of deciding their future. Many of them are fed up with promises made by unscrupulous politicians who campaign at election time in poverty-stricken areas, promising better infrastructure and living conditions, but who seem to vanish in the mist when the elections are over, leaving the poorest of the poor to battle against corruption at local government level, inadequate sanitation and a chronic shortage of housing. And they are armed - not with guns or knives, but with technology. They have the world at their fingertips as they tap at smartphones. This election, even the disenfranchised, the poverty-stricken and the marginalized have access to internet, Facebook, Twitter, Whatsapp and BBM. Some would argue that this is a sign that the government has done much to improve ICT in the country. Others would say it is an indication of the determination of the youth of South Africa, looking for their own opportunities in a land of high unemployment and limited educational resources. The Independent Electoral Commission (IEC) on Sunday issued a statement asking that no ‘selfies’ – photographs people take of themselves using their mobile phones – were to be taken inside the voting booths, claiming it would undermine the secrecy of the vote. 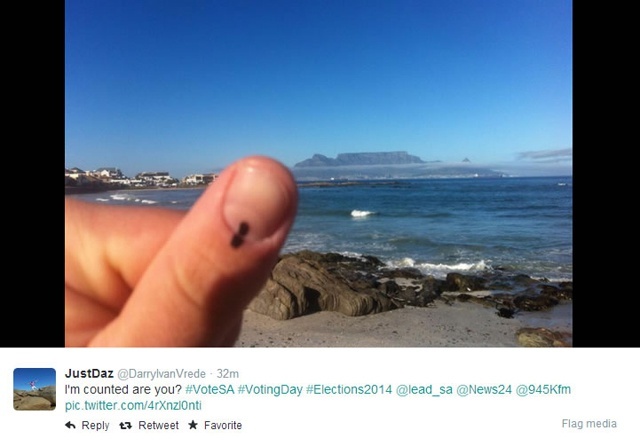 The plea came after a flood of voting selfies were seen on social media platforms when South Africans abroad voted on 30 April. Although the use of camera phones inside the voting booths have been prohibited, the IEC still recognises the valuable role social media can play during elections, citing an incident where a voting irregularity was reported on Monday via Twitter. The incident, which involved a staff member from a temporary voting station in Gauteng province who had used the nearby house of a party agent to store materials overnight, was dealt with by the IEC swiftly, and chief electoral officer Mosotho Moepya yesterday thanked the whistleblowers in his statement on election readiness. “We thank those who brought this our attention for their vigilance and help. Yesterday we mentioned the challenge of cellphones and social media with regards to breaching secrecy. But this was a case in which a cellphone camera, an alert party agent and the power of social media helped enhance credibility of this election,” Moepya said. The numbers of new registrations in the run-up to the elections was disappointing though, with only a third of 18- and 19-year-olds registering, according to the IEC. This voter apathy among the youth, common in many parts of the world, may well indicate a sense of disillusionment in the democratic system that has led to unrest and violence in many countries over the past few years. The ANC has enjoyed a comfortable majority in government since Nelson Mandela was voted in as South Africa’s first black president in 1994, and current president Jacob Zuma has said that the ANC will rule South Africa until the second coming of Jesus – a flippant remark that has irked many detractors of the ANC. But it is widely predicted that the ANC will once again win the 2014 elections by a comfortable margin, with analysts forecasting a 60% majority for the ruling party. For many, it seems that the official opposition to the ANC, the Democratic Alliance, will never be an acceptable alternative to the black voter. Newer, smaller parties, such as the controversial Julius Malema’s Economic Freedom Fighters and struggle icon Mamphela Ramphele’s AGANG may attract a small percentage of votes but may be regarded as inexperienced and unreliable. The general sense of frustration and anger directed at all political parties in South Africa has been highlighted by the 'Vote No' campaign, headed by South African anti-apartheid struggle veterans Ronnie Kasrils and Nozizwe Madlala-Routledge. The campaign asks citizens to use their vote to show their dissatisfaction with the ruling ANC, either through spoiling their ballot or tactically voting for smaller opposition parties to weaken the ANC’s majority. The ‘Vote No’ campaign earned some heavy criticism from party leaders who said encouraging voters to spoil their ballots was a slap in the face for struggle veterans and others who lost their lives fighting so that all South Africans could gain the right to vote. Many newspaper editorials, including the iconic Mail & Guardian also urged voters not to spoil their ballots. As much as the issues have been debated in the media, on social platforms and around dinner tables, it is now up to the people of South Africa, especially the ‘born-frees’, to decide their own fate. Standing in queues like their predecessors of 1994, black, white, Indian and mixed race, they are perhaps better equipped because of mobile technology and social media to decide on the future of the country. They have the power to shape the South Africa of the next five years, if only they will use it wisely.